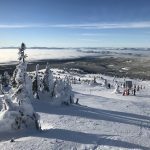 Amazing snow conditions for our New Year ski trip to Big White. We were lucky to have great friends joining us from Germany, Ireland, Ontario, and Vancouver. Our interest in downhill skiing has been fully restored! Escaped the crowds on the August long weekend by hiking into Mamquam Lake in the southern part of Garibaldi Provincial Park. 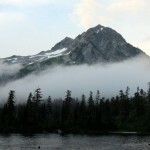 Mamquam Lake is just 11 km beyond the super-popular Elfin Lakes, but is a relatively rough trail due to a washout on Ring Creek. There weren’t many people on Saturday night and we had the whole lake to ourselves on Sunday night. Fabulous! 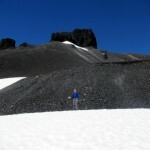 A metre of snow in the campground, but glorious weather for the Canada Day long weekend at Garibaldi. An extra bonus – too early in the year for the crowds and the bugs. We spent two nights at the lake and had a great day hike up to the base of the Black Tusk.